The Sketch Files: Oliver again, but this time with a twist. 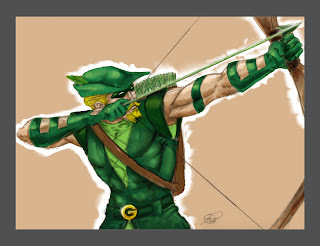 I was messing around and dedcided to finally color this Green Arrow. There are some problems but it was just a rough sketch and I'm satisfied with it. I love the greens. It's a beautiful sketch. I am going to have an art show next weekend, see if you can make it!! Check my blog for information! !